Drummer, guitar player, singer and composer J.Kirby Bivans participated in recording a number of discs in his hometown of Chicago He had the chance to play with Emmy Lou Harris and Graham Parsons, among others while pursuing a university music degree. Moving to Nashville in 1983, he accompanied Grand Ole Opry stars Jean Shepard, Billy Walker, Lorrie Morgan and Kitty Wells. He toured and recorded with Vassar Clements, Nicolette Larson, Cal Smith and was lucky enough to play drums behind the legendary Carl Perkins. Ten years later, following a European tour with MCA recording artist Karen Staley, he decided to move to Switzerland and formed the J.Kirby's Band. In 1994, J.Kirby recorded his first CD Riding and Free, composed mostly of original songs. Since that time, the group participated in festivals at Geneva, Montreux, Les Diablerets, Interlaken, Mirande (biggest country festival in Europe), Craponne-sur-Arzon, among others. J.Kirby composed the songs of his second album Rocky Tequila recorded in 1997 with his musicians. Fall 2002, the band has released its third CD Highway To Your Heart, also composed of original songs, most of them written by Kirby or co-written with other artists, and one instrumental composed by the fiddle player John Intrator. In 1994, J. Kirby's Band released its fourth album Four On The Floor, again all original songs, a mix of all the interesting styles you can find in country music. This four albums have given birth to the CD Reflections in Chrome, the best of 20 years in 2014. 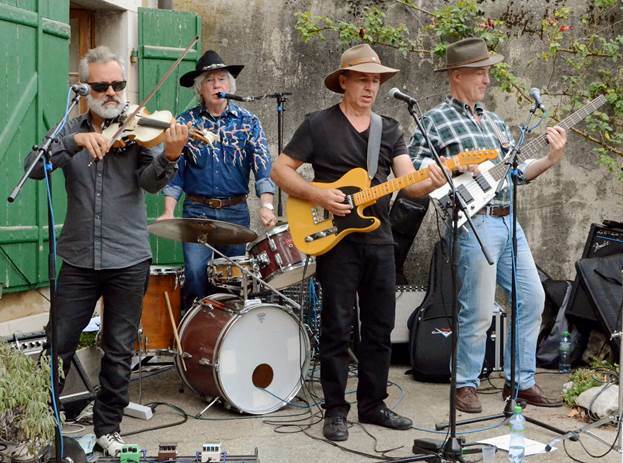 In concert the J.Kirby's Band performs a dynamic mix of country, sixties-rock, bluegrass and cajun music. Its repertoire ranges from the traditional Johnny Cash and Willie Nelson songs through the contemporary Garth Brooks and Alan Jackson songs in addition to original compositions. ...Very good songs, a very beautiful production; a truly large sound on the level of Nashville discs. ... He left his hometown to play drums in Nashville and, since that day, Kirby never looked back. His enthusiasm fires the concert halls and he knows how to address a song to each and everyone in the audience. ... The Swiss-Americans of J. Kirby's Band have showed the differences in culture to be the ideal road to touch our senses.